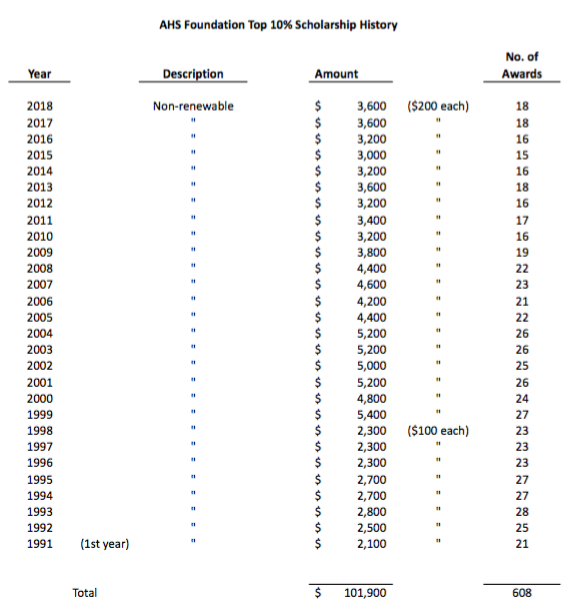 With the advent of the Academic Recognition Dinner in 1989 honoring the top ten percent of the graduating class, the AHS Foundation decided to endorse that effort. The goals of both groups, to encourage academic excellence and recognize scholarship, are aligned and continue to create a natural synergy. Beginning in May 1991, the Board of Trustees decided to recognize each member of the top ten percent of the graduating class by presenting them with $100 awards. In 1999, the amount of the award was increased to $200. While the Foundation has since grown to where it awards many other scholarships in much higher amounts, its recognition of the members of the top ten percent at the Academic Recognition Dinner continues to this day.